Tim Paine will be Australia’s wicketkeeper for the first two Ashes Tests this summer after the Tasmanian was named in a 13-man squad on Friday morning. News of Paine’s selection leaked to the press last night, with critics of the decision quick to point out his lack of Sheffield Shield form – he hasn’t kept for the Tigers this season due to Matthew Wade taking the gloves, and hasn’t scored a Shield century since 2006. But selector Trevor Hohns threw his support behind Paine, hailing his recent form with the bat in first-class cricket. Paine beat out the incumbent Wade, as well as fellow contenders Peter Nevill and Alex Carey, to earn selection for Australia. Cameron Bancroft, who had been touted as another option to take the gloves, has been included in the squad at the expense of Matthew Renshaw, and is set to open the batting alongside David Warner. Many had tipped Renshaw to retain his place in the side, but a horror run of scores for Queensland in the opening three rounds of Shield cricket forced selectors to opt for Bancroft instead. The West Australian has been in scintillating form recently, producing an unbeaten double-century for the Warriors in their latest Shield outing against South Australia. That came on the back of an impressive performance against New South Wales, when Bancroft carried his bat in the first innings against the first-choice Test attack with 76 not out then followed it up with 86 in the second dig. “Cameron has been a player of interest to us for some time now, having been unlucky to miss out on the Test tour to Bangladesh that was cancelled in 2015,” said Hohns. “He is a very talented and tough cricketer who shows a good temperament for Test cricket. 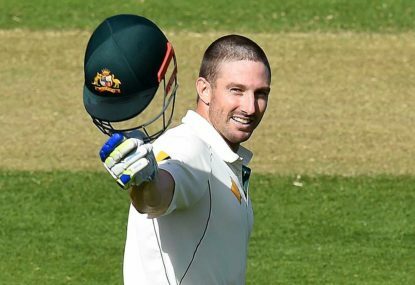 Bancroft’s state teammate Shaun Marsh has replaced Glenn Maxwell as the side’s number six batsman despite some indifferent form. Marsh is averaging a tick under 40 with the willow so far this season, less than Maxwell (40), Jake Lehmann (49.8) and Daniel Hughes (70.33). Chadd Sayers is a surprise inclusion as a back-up paceman, picked with an eye towards the second Test on his home ground at the Adelaide Oval. “Chadd’s inclusion in the squad is with a view to the Adelaide Test and the conditions that we may see there. “He swings the ball with good control and knows the conditions well at his home ground. Jackson Bird, Mitchell Starc, Pat Cummins, Josh Hazlewood and Nathan Lyon are the other bowlers to have earned selection. Steve Smith is the side’s captain and David Warner his deputy, with Usman Khawaja and Peter Handscomb the other two batsmen in the squad.